Mercedes-Benz has revealed its practical new B-Series at the 2018 Paris Motor Show. Set to go on sale in December, the new B-Class is closely related to the new A-Class. A rival to the BMW 2 Series Active Tourer, the new B-Class features a much improved cabin, similar to that in the A-Class. It also gets the MBUX multimedia system, as used in the A-Class, including the voice controlled 'Hey Mercedes' infotainment assistant. Depending on spec, the B-Class features a combination of 10.25-inch and seven-inch infotainment displays providing access to the radio and navigation, while a head-up display is also available as an option. From mid-2019, selected models will feature rear seats which can be moved by 14cm to vary the boot capacity between 455 and 705 litres depending on what you wish to prioritise. The rear seats can be folded flat to provide up to 1540 litres of space behind the front seats, while a folding backrest of the front passenger seat is expected to be offered from mid-2019. 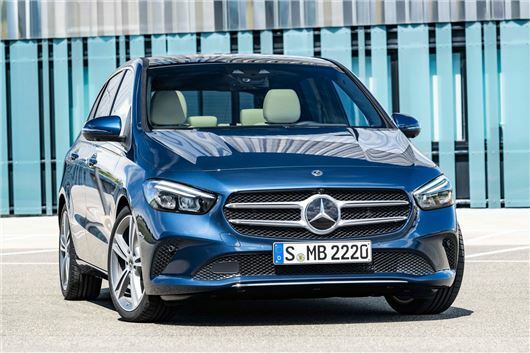 Intending to attract a younger market than its predecessor, Mercedes-Benz says the new B-Class will be sportier and more dynamic to drive than ever before. At launch, buyers will be able to choose from five engines, made up of two petrols and three diesels and all combined with a seven- or eight-speed dual-clutch automatic gearbox. The entry-level petrol is a 1.3-litre petrol badged the B 180 producing 136PS, while the same engine is available in 163PS guise badged the B 200. Advertised economy will be between 50.4mpg and 52.3mpg depending on specification, while emitting 124-129g/km CO2. The diesel range is made up of the B 180d (116PS), B 200d (150PS) and B 220d (190PS). Official fuel economy ranges from 52.3mpg to 68.9mpg. Various suspension options are available including active adaptive damping, which lets the driver adjust the firmness of the ride using the Dynamic Select buttons. There's a host of driver assistance features which have trickled their way down from the S-Class, including semi-autonomous functions such as the Active Distance Assist Distronic, which can predictively adjust the cruise control's speed when approaching bends, junctions or roundabouts. Prices for the new B-Class are yet to be announced, but it's expected to start at around £25,000 when it goes on sale on 3 December 2018. UK deliveries will start in February 2019.